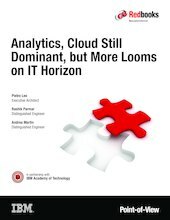 A new survey of thousands of IBM experts puts analytics, cloud, and mobile at the top of the IT trend list worldwide, reinforcing the company’s leadership and investment in these critical areas. Analytics remains atop of the ranking for the fourth straight year, as companies continue to seek more and better insight from their data. Cloud and mobile, too, remain firmly near the top, reflecting both continued demand for cost-saving hosted infrastructures and a growing reliance on devices that help users conduct business while on the move. But lists of trends are interesting for more than just what sits at the top. What emerging topics have the IT experts excited? Last year, the IBM survey team elevated digital transformation, intelligent automation, and wearable computing to the list. Now, for 2015, they have added cognitive business, new software models, and the IT infrastructure of tomorrow. The annual IBM Academy of Technology survey represents the collective opinion of thousands of IBM experts around the world, from executives to developers to field engineers, each informed by their own networks of social, customer, and industry contacts. In addition to assessing today’s IT landscape, the survey also seeks to identify the societal and business factors that will drive the new technology of tomorrow. IBM uses the survey to help guide its intellectual investments and solution designs. But results provide a timely snapshot for anyone interested in where most IT spending and new business opportunity are likely to occur in the next 12-24 months.